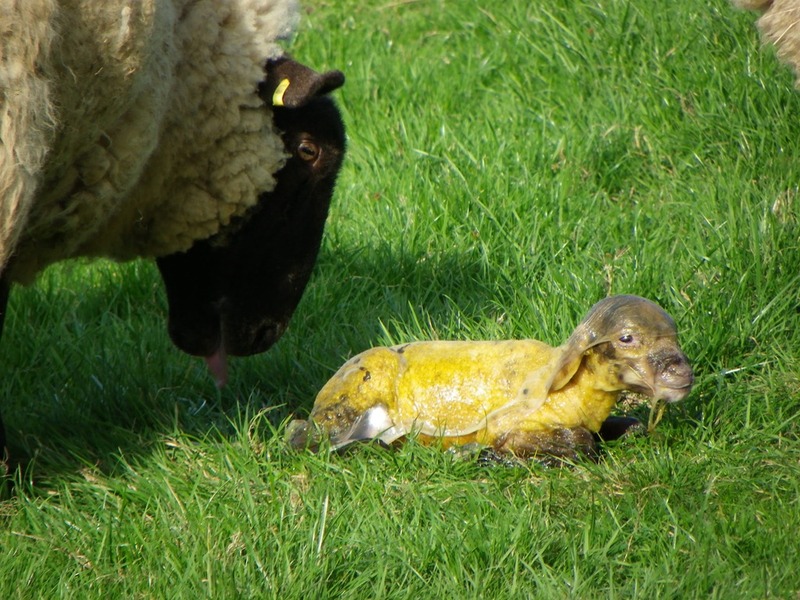 The lambing season is now in full swing and the field next to my garden is used for lambing at this time of the year. The weather this weekend is very warm making mowing one of my laws a pleasant task. 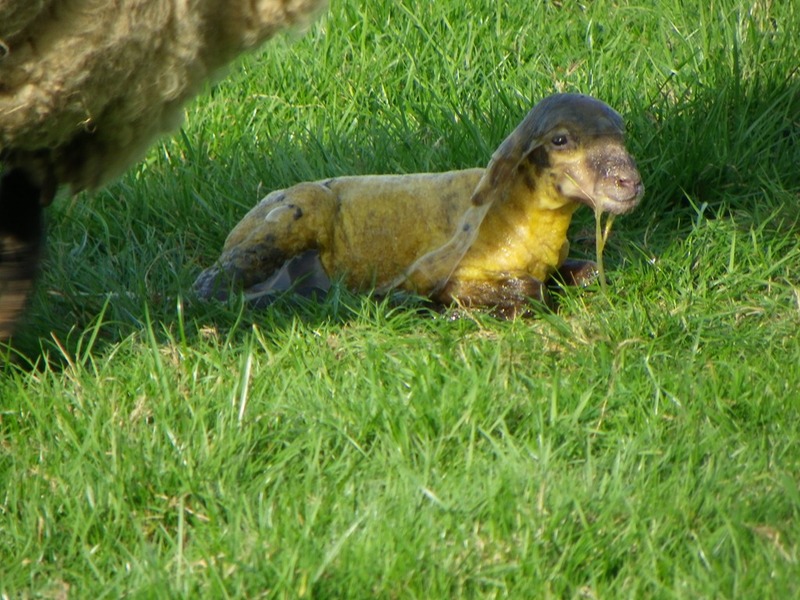 By perchance I noticed a sudden movement in the adjoining field close to my fence as a ewe gave birth to a lamb. I ceased my mowing, grabbed my camera and took a the pictures below. The lamb in the photographs is only a few minutes old. With that I went back to my mowing with the strangely pleasant feeling that a new life had just come into the world. This year March has arrived not in keeping with the traditional saying of coming in like a lion and going out like a lamb, but with rather a very unseasonal, yet still very welcome burst of warm sunshine. This unseasonal warmth has caused the daffodils to burst into flower earlier than normal and the profusion of bright yellow everywhere is a feast for the eyes as the drab winter draws to a close. The warmth has brought forward traditional chores like mowing the grass earlier than anticipated. 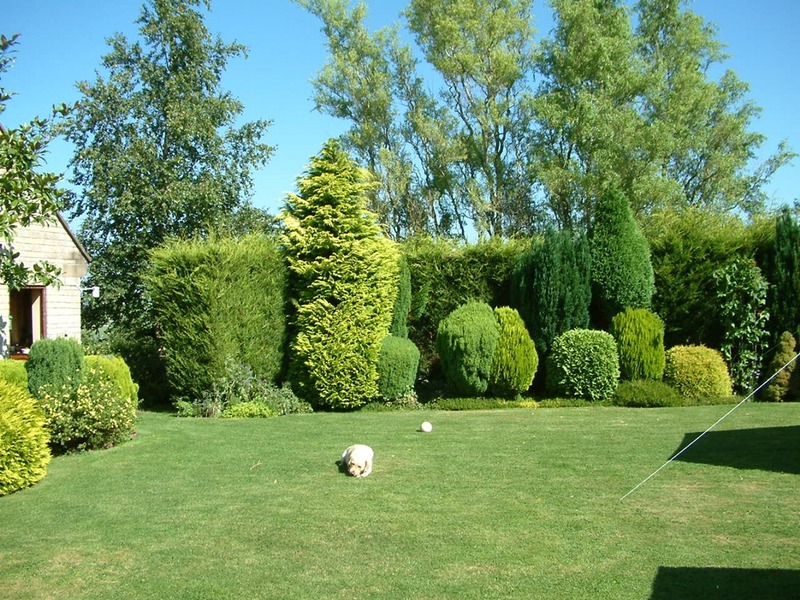 I have three lawns at my home plus an additional grass strip, all far larger than the more traditional lawns found in many suburban homes. While this sea of green has a comforting restfulness on the eye, there is still a price to pay in the additional workload of keeping it under control. In the West Country where my home is located, grass grows far more profusely than Eastern England mainly due to warmth and plentiful moisture than abounds in this region. It is one of the reasons that the dairy industry flourished in this part of the country. A few new-born lambs can already be seen in the fields but in the next few weeks as the lambing season is in full swing, great flocks of lambs and their mother ewes will be seen everywhere. This great seasonal explosion of new life is also a noisy time with the bleating cries of thousands of hungry lambs calling out to their mothers. As the years have passed, I have become accustomed to watching the habits of newly born lambs in the fields around me. For about the first two weeks they will not venture from their mothers side. Every footstep the mother takes is immediately replicated by her offspring ensuring they remain in close physical contact. After these initial two weeks, the lambs tend to take notice their fellow lambs in the flock and as their strength and confidence grows, gangs of lambs can be seen chasing around the fields. Frequently a lamb will attempt to suckle from a strange ewe but they are always brushed aside. 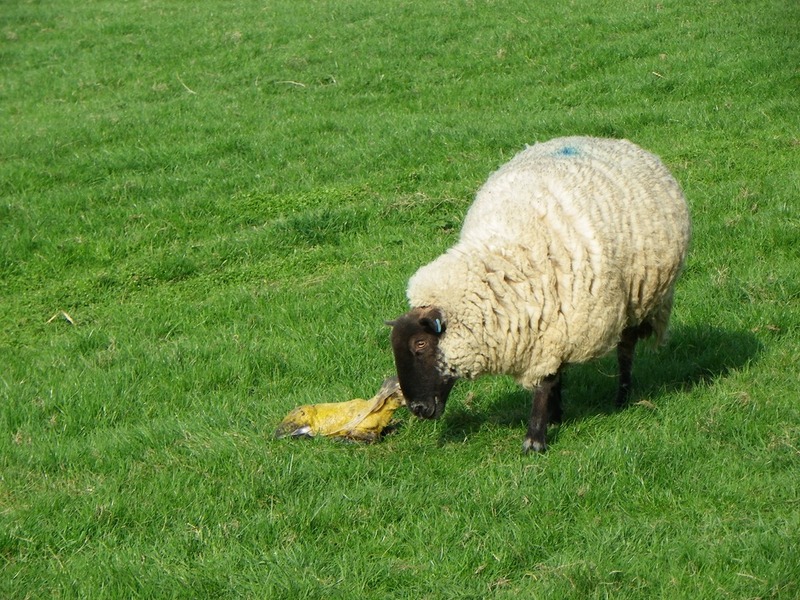 Ewes know which lamb is their offspring by scent alone and will let none other feed from them. In the village where I live, a number of our friends have formed a birthday luncheon club. As our birthdays tend to be spread throughout the year we usually go out once a month for a pub lunch with the celebrant choosing the venue. The celebrant also pays for the drinks while everyone pays for their own meals. Last month we went to a local pub called the Kingsdon Inn. This is a 300 year old thatched pub located in the village of Kingsdon which I can see on a distant hill from my home. I had not been to the Kingsdon Inn for some time due to a fire destroying not only the thatched roof but much of the upper floor too. Fortunately their were no injuries and extensive refurbishment is now complete. We have many similar pubs in this part of the country where very goods meals are served at modest rates. 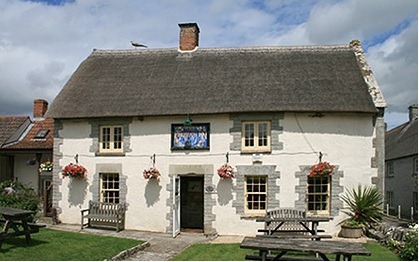 Most of these local pubs are family businesses with a superb welcoming atmosphere. Service is usually friendly, personal and swift in contrast to the atmospheres I have sometimes experienced in some of the more commercially owned chains of public houses. I will be making a trip back to the “Big Smoke” of London in the forthcoming week for the funeral of my last aunt. Every time I return to London it seems to have changed once again and it is not a place I now particularly enjoy visiting. All my life until a few weeks ago there has always been an older generation in my family. Now with the passing of my aunt that older generation is no more. It is a strange feeling that I am now the older generation. It is also a strange feeling that overnight I became the patriarch of my greater family. Although born and bred in London, the greatest enjoyment I now get from the place is when I leave it. My journey home normally takes me south along the M3 motorway before joining the start of the A303 to the West Country which then takes me all the way home. Once pass the outer ring of the M25 motorway, buildings rapidly melt away giving ground to the open countryside that I now find so reassuring. As the journey continues, the volume of traffic also rapidly decreases as motorway turn-offs to the various towns are reached. I normally find that as I approach and then pass Andover, traffic volume is whittled down to almost nothing. It is as if the various turn-offs that line the road around Andover act as a great sponge, mopping up most traffic that has journeyed that far from London. Beyond Andover the scenery gives way to the great rolling countryside of Salisbury Plain. As we climb the hills of this plateau, we near Beacon Hill which was a designated spot for a great fiery beacon to give warning of the approach of the Spanish Armada. Beacon Hill sticks out like a sentinel guarding the approach to the West Country before we soon pass Stonehenge with its many visitors, providing there is still light to view this monolithic structure. To me apart from its fascinating and controversially debated history, Stonehenge is also a milepost signalling that Somerset and home is only another 40 miles away.